According to scholars, it is crucial to know what this strategy was designed for to understand it comprehensively. COIN strategy aims to achieve the support of local population for the government created by host nation. The main point of the modern counterinsurgency campaign is not simply kill and capture insurgents, but to improve living conditions, support government in providing services for people and eliminate any support for insurgency. During the Vietnam War, counter-insurgency initially formed part of the earlier war as Diem had implemented the poorly conceived Stragic Hamlet Program, a similar model to the Malayan Emergency whom had opposite effects. Similarly economic and rural development formed a key strategy as part of Rural Affairs development. While the earlier war was marked by considerable emphasis on counter-insurgency programs US forces initially relied on very little if any theoretical doctrine of counter-insurgency during the Joint warfare in South Vietnam, 1963–69 phase. This was more or less a failing strategy on the part of the United States, as conventional means were applied in direct contradiction to the wisdom of counter-insurgency. General Patrick Walters, British commander of troops in northern Ireland, explicitly stated that his objective was not to kill as many terrorists as possible, but to ensure that as few people on both sides were killed. In the vast majority of counterinsurgencies, the "forces of order" kill far more people than they lose. In contrast and using very rough figures, the struggle in Northern Ireland had cost the United Kingdom three thousand casualties in dead alone. Of the three thousand, about seventeen hundred were civilians...of the remaining, a thousand were British soldiers. No more than three hundred were terrorists, a ratio of three to one. If the prerequisites for the first method – excellent intelligence, superbly trained and disciplined soldiers and police, and an iron will to avoid being provoked into lashing out – are lacking, van Creveld posits that counterinsurgents who still want to win must use the second method exemplified by the Hama massacre. In 1982 the regime of Syrian president Hafez al-Assad was on the point of being overwhelmed by the countrywide insurgency of the Muslim Brotherhood. al-Assad sent a division under his brother Rifaat to the city of Hama, known to be the center of the resistance. Following a counterattack by the Brotherhood, Rifaat used his heavy artillery to demolish the city, killing between ten and 25 thousand people, including many women and children. Asked by reporters what had happened, Hafez al-Assad exaggerated the damage and deaths, promoted the commanders who carried out the attacks, and razed Hama's well-known great mosque, replacing it with a parking lot. With the Muslim Brotherhood scattered, the population was so cowed that it would be years before opposition groups dared to disobey the regime again and, van Creveld argues, the massacre most likely saved the regime and prevented a bloody civil war. Another writer who explores a trio of features relevant to understanding counter-insurgency, is Dr. Akali Omeni. Within the contemporary context, COIN warfare by African militaries tends to be at the margins of the theoretical debate - even though Africa today is faced with a number of deadly insurgencies. In Counter-insurgency in Nigeria, Omeni, a Nigerian academic, discusses the interactions between certain features away from the battlefield, which account for battlefield performance against insurgent warfare. Specifically, Omeni argues that the trio of historical experience, organisational culture (OC) and doctrine, help explain the institution of COIN within militaries and their tendency to reject the innovation and adaptation often necessary to defeat insurgency. These three features, furthermore, influence and can undermine the operational tactics and concepts adopted against insurgents. The COIN challenge, therefore, is not just operational; it also is cultural and institutional before ever it reflects on the battlefield. Whereas the Nigerian military’s performance against militias in the Niger Delta already suggested the military had a poor grasp of the threat of insurgent warfare; it was further along the line, as the military struggled against Boko Haram’s threat, that the extent of this weakness was exposed. At best, the utility of force, for the Nigerian military, had become but a temporary solution against the threat of insurgent warfare. At worst, the existing model has been perpetuated at such high cost, that urgent revisionist thinking around the idea of counter-insurgency within the military institution may now be required. Additionally, the military’s decisive civil war victory, the pivot in Nigeria’s strategic culture towards a regional role, and the institutional delegitimization brought about by decades of coups and political meddling, meant that much time went by without substantive revisionism to military’s thinking around its internal function. Change moreover, where it occurred, was institutionally isomorphic and not as far removed from the military’s own origins as the intervening decades may have suggested. Further, the infantry-centric nature of the Nigerian Army's battalions, traceable all the way back to the Civil War in Nigeria back in the 1960s, is reflected in the kinetic nature of the Army's contemporary COIN approach. This approach has failed to defeat Boko Haram in the way many expected. Certainly, therefore, the popular argument today, which holds that the Nigerian Army has struggled in COIN due to capabilities shortcomings, holds some merit. However, a full-spectrum analysis of the Nigeria case suggests that this popular dominant narrative scarcely scratches the surface of the true COIN challenge. This population-centered challenge, moreover, is one that militaries across the world continue to contend with. And in attempting to solve the COIN puzzle, state forces over the decades have tried a range of tactics. One of the earliest examples of the strategy was applied by the British Empire during the Second Boer War; to segregate potential Boer supporters from Boer Commandos, scorched earth tactics were used to destroy Boer farmland while Boers were shipped abroad or confined to concentration camps converted from refugee camps for displaced Boers. The tactic was later refined in the Briggs Plan during the Malayan Emergency, when predominantly Chinese rural population centers with suspected Malayan Races Liberation Army sympathizers were gutted and their populations transferred to enclosed and guarded "New Villages" to control and monitor population activity; to improve local support for the British, New Villages were equipped with adequate basic amenities, including running water, electricity, and health and education services. A somewhat similar strategy was used extensively by US forces in South Vietnam until 1969, initially by forcing the rural population into fenced, secured villages, referred to as Strategic Hamlets, and later by declaring the areas people in the Strategic Hamlets had come from as free-fire zones to remove the remainder of the population from their villages and farms. Widespread use was made of Agent Orange (which was first used on a large scale by the British during the Malayan Emergency), sprayed from airplanes, to destroy crops that might have provided resources for Viet Cong and North Vietnamese troops and their human support base. These measures proved ineffective, since Phạm Ngọc Thảo, who oversaw the program, was a communist agent and sabotaged the implementation of the hamlets. This allowed Viet Cong activists and sympathizers to infiltrate the new communities. In any event, the Vietnam War was only partly a counter-insurgency campaign, as it also involved conventional combat between US/ARVN forces, Vietcong Main Force Battalions, and the North Vietnamese Army (NVA). The oil spot approach is the concentration of counter-insurgent forces into an expanding, secured zone. The origins of the expression is to be found in its initial use by Marshal Hubert Lyautey, the main theoretician of French colonial warfare and counter-insurgency strategy. The oil spot approach was later one of the justifications given in the Pentagon Papers for the Strategic Hamlet Program. "Political, social, and economic programs are usually more valuable than conventional military operations in addressing the root causes of the conflict and undermining the insurgency." These programs are essential in order to gain the support of the population. These programs are designed to make the local population feel secure, safe, and more aligned with the counterinsurgency efforts; this enables the citizens of the host nation to trust the goals and purposes of the counterinsurgency efforts, as opposed to the insurgents’. A counterinsurgency is a battle of ideas and the implementation and integration of these programs is important for success. Social, political and economic programs should be coordinated and administered by the host nation’s leaders, as well. Successful COIN warfare allows the population to see that the counterinsurgency efforts are including the host nation in their re-building programs. The war is fought among the people and for the people between the insurgents and the counterinsurgents. Public diplomacy in information operations can only be achieved by a complete understanding of the culture it is operating in. Counterinsurgency operations must be able to perceive the world from the locals’ perspective. To develop a comprehensive cultural picture counterinsurgency efforts should invest in employing "media consultants, finance and business experts, psychologists, organizational network analysts, and scholars from a wide range of disciplines." Most importantly, counterinsurgency efforts need to be able to understand why the local population is drawn into the insurgent ideology, like what aspects are appealing and how insurgents use information to draw their followers into the ideology. Counterinsurgency communication efforts need a baseline understanding of values, attitudes, and perceptions of the people in the area of operations to conduct successful public diplomacy to defeat the enemy. Public diplomacy is especially important as modern insurgents are more easily able to gain support through a variety of sources, both local and transnational, thanks to advances in increased communication and globalization. Consequently, modern counter-insurgency requires attention to be focused on an insurgency's ecosystem from the national to the local level, in order to deprive the insurgency of support and prevent future insurgent groups from forming. During the Vietnam War, counter-insurgency initially formed part of the earlier war as Diem had implemented the poorly conceived Stragic Hamlet Program, a similar model to the Malayan Emergency whom had opposite effects. Similarly economic and rural development formed a key strategy as part of Rural Affairs development. 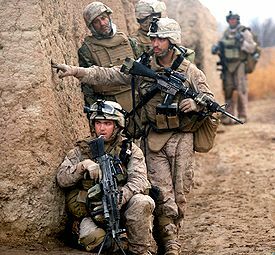 While the earlier war was marked by considerable emphasis on counter-insurgency programs US forces initially relied on very little if any theoretical doctrine of counter-insurgency during the Ground-Intervention phase. Conventional warfare using massive fire-power and failure to implement adequate counter-insurgency had extremely negative effects and was the strategy whom the NVA were adept at countering through the protracted political and military warfare model. These are in part, reasons for the outright failure of U.S strategic policy in the war. Following the replacement of General William Westmoreland, newer concepts were tried including a revival of earlier COIN strategies including Civil Operations and Revolutionary Development Support. This was alongside the brutal and often-times badly implemented civilian-assassination program Phoenix Program targeting Viet Cong civilian personnel. These reasons were contributing factors to the U.S failure as it had become too late by then. British forces were able to employ the relocation method with considerable success during the "Malayan Emergency". 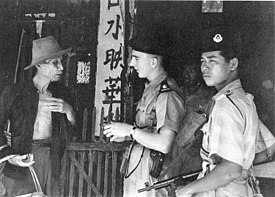 The Briggs Plan, implemented fully in 1950, relocated Chinese Malayans into protected "New Villages", designated by British forces. By the end of 1951, some 400,000 ethnic Chinese had moved into the fortifications. Of this population, the British forces were able to form a "Home Guard", armed for resistance against the Malayan Communist Party, an implementation mirrored by the Strategic Hamlet Program later used by US forces in South Vietnam. Despite British claims of a victory in the Malayan Emergency, military historian Martin van Creveld noted that the end result of the counterinsurgency, namely the withdrawal of British forces and establishment of an independent state, are identical to that of Aden, Kenya and Cyprus, which are not considered victories. During the South Sulawesi Campaign Captain Raymond Westerling of the KST, Special Forces of the Royal Netherlands East Indies Army used the Westerling Method. Westerling ordered the registration of all Javanese arriving in Makassar due to the large numbers of Javanese participating in the Sulawesi resistance. He also used scouts to infiltrate local villages and to identify members of the resistance. Based on their information and that of the Dutch military intelligence service, the DST surrounded one of more suspected villages during night, after which they drove the population to a central location. At daybreak, the operation began, often led by Westerling. Men would be separated from women and children. From the gathered information Westerling exposed certain people as terrorists and murderers. They were shot without any further investigation. Afterwards Westerling forced local communities to refrain from supporting guerillas by swearing on the Quran and established local self-defence units with some members recruited from former guerrillas deemed as "redeemable". Westerling directed eleven operations throughout the campaign. He succeeded in eliminating the insurgency and undermining local support for the Republicans. His actions restored Dutch rule in southern Sulawesi. However, the Netherlands East Indies government and the Dutch army command soon realised that Westerling's notoriety led to growing public criticism. In April 1947 the Dutch government instituted an official inquiry of his controversial methods. Raymond Westerling was put on the sidelines. He was relieved of his duties in November 1948. Post-WWII doctrine, as in Indochina, took a more drastic view of "Guerre révolutionnaire", which presented an ideological and global war, with a commitment to total war. Countermeasures, in principle, needed to be both political and military; "No measure was too drastic to meet the new threat of revolution." French forces taking control from the Japanese did not seem to negotiate seriously with nationalist elements in what was to become Vietnam, and reaped the consequences of overconfidence at Điện Biên Phủ. As some of the French Army protested, other parts increased the intensity of their approach, which led to an attempted military coup against the French Fourth Republic itself. Massu and General Raoul Salan led a 1958 coup in Algiers, demanding a new Republic under Charles de Gaulle. When de Gaulle's policies toward Algeria, such as a 1961 referendum on Algerian self-determination, did not meet the expectations of the colonial officers, Salan formed the underground Organisation armée secrète (OAS), a right-wing terrorist group, whose actions included a 1962 assassination attempt against de Gaulle himself. France has had taken Barnett's Leviathan role in Chad and Ivory Coast, the latter on two occasions, most significantly in 2002-2003. The situation with France and Ivory Coast is not a classic FID situation, as France attacked Ivorian forces that had provoked UN peacekeepers. Another noteworthy instance of counter-insurgency in West Africa is the Nigerian military experience against Boko Haram militant Islamists. Military operations against the group occur predominantly in the far north-east areas of Nigeria. These operations have been ongoing since June 2011, and have greatly expanded within the Lake Chad Basin sub-region of West Africa. There have been many insurgencies in India since its independence in 1947. The Kashmir insurgency, which started by 1989, was brought under control by Indian government and violence has been reduced. A branch of the Indian Army known as the Rashtriya Rifles (RR) was created for the sole purpose of destroying the insurgency in Kashmir, and it has played a major role in doing so. The RR was well supported by Central Reserve Police Force (CRPF), Border Security Force (BSF), Indo-Tibetan Border Police (ITBP) and state government police. The Counter Insurgency and Jungle Warfare School (CIJWS) is located in the northeastern town of Vairengte in the Indian state of Mizoram. Personnel from countries such as the United States, the United Kingdom, France, Russia, Kazakhstan, Tajikistan and Vietnam have attended this school. High quality graduate level training by a joint staff of highly trained special operators at Camp Taji Phoenix Academy and the Counterinsurgency Centre For Excellence is provided in India as well as many Indian Officers. Destroy the springs of resistance through destruction of settlements, livestock, crops etc. These tactics, generally speaking, were carried over into Soviet use following the 1917 revolution for the most part, say for the integration of political-military command. This tactical blue print saw use following the First and Second World Wars in Dagestan, the Caucasus, Central Asia, Siberia, Lithuania and Ukraine. This doctrine was ultimately shown to be inadequate in The Soviet War in Afghanistan, mostly due to insufficient troop commitment, and in the Wars in Chechnya. Part one provides strategic and operational context, part two provides the doctrine for understanding insurgencies, and part three provides doctrine for defeating an insurgency. In short, FM 3-24/MCWP 3-33.5 is organized to provide the context of a problem, the problem, and possible solutions. The 101st Airborne Division will serve an integral role in preparing Iraqi ground troops to expel the Islamic State group from Mosul, Defense Secretary Ash Carter told the division's soldiers during a January 2016 visit to Fort Campbell, Kentucky. Defense Secretary Ash Carter told the 101st Airborne Division that "The Iraqi and peshmerga forces you will train, advise and assist have proven their determination, their resiliency, and increasingly, their capability, but they need you to continue building on that success, preparing them for the fight today and the long hard fight for their future. They need your skill. They need your experience." Foreign internal defense policymaking has subsequently aided in Iraqi successes in reclaiming Tikrit, Baiji, Ramadi, Fallujah, and Mosul from the Islamic State of Iraq and the Levant. ^ a b U.S. Government Counterinsurgency Guide (PDF). Bureau of Political-Military Affairs, Department of State. 2009. Retrieved September 1, 2014. ^ "A Decade at War: Afghanistan, Iraq and Counterinsurgency | America Abroad Media". americaabroadmedia.org. Retrieved 2017-11-26. ^ Eizenstat, Stuart E.; John Edward Porter; Jeremy M. Weinstein (January–February 2005). "Rebuilding Weak States" (PDF). Foreign Affairs. 84 (1). ^ John Mackinlay, The Insurgent Archipelago, (London: Hurst, 2009). ^ Caldwell, William B. (8 February 2007). "Not at all vague". Washington Times. Retrieved 16 October 2011. ^ Excerpts from Santa Cruz's writings, translated into English, in Beatrice Heuser: The Strategy Makers: Thoughts on War and Society from Machiavelli to Clausewitz (Santa Monica, CA: Greenwood/Praeger, 2010), ISBN 978-0-275-99826-4, pp. 124-146. ^ a b c "Counterinsurgency in Vietnam: Lessons for Today - The Foreign Service Journal - April 2015". www.afsa.org. ^ Reeder, Brett. "Book Summary of Counterinsurgency Warfare: Theory and Practice by David Galula". Crinfo.org (The Conflict Resolution Information Source). Retrieved 2008-09-22. ^ Thompson, Robert (1966). Defeating Communist insurgency: the lessons of Malaya and Vietnam. New York: F.A. Praeger. ^ Hamilton, Donald W. (1998). The art of insurgency: American military policy and the failure of strategy in Southeast Asia. Greenwood Publishing Group. ISBN 978-0-275-95734-6. ^ a b c Kilcullen, David (28 September 2006). "Three Pillars of Counterinsurgency" (PDF). ^ Omeni, Akali (2017) Counter-insurgency in Nigeria: The Military and Operations Against Boko Haram, 2011-17. Abingdon, Oxon: Routledge. pp. 52-53. ^ Omeni, Akali (2018) Insurgency and War in Nigeria: Regional Fracture and the Fight Against Boko Haram (forthcoming) I.B. Tauris. ^ Sepp, Kalev I. (May–June 2005). "Best Practices in Counterinsurgency" (PDF). Military Review: 8–12. ^ a b Porch, Douglas. "Bugeaud, Galliéni, Lyautey: The Development of French colonial warfare", in Paret, Peter; Craig, Gordon Alexande; Gilbert, Felix (eds). Makers of Modern Strategy: From Machiavelli to the Nuclear Age (Oxford: Oxford University Press, 1986), pp. 376-407. ^ "Pentagon Papers, Gravel Edition, Volume 3, Chapter 1, "US Programs in South Vietnam, Nov. 1963-Apr. 1965,: section 1". Mtholyoke.edu. Retrieved 2009-10-03. ^ "Basic Counter-Insurgency". Military History Online. Retrieved 2009-10-03. ^ "Vignette 7: Search (Cordon and Search)". Globalsecurity.org. Retrieved 2013-09-04. ^ "Tactics 101: 026. Cordon and Search Operations". Armchair General. Retrieved 2009-10-03. ^ Chronology: How the Mosul raid unfolded. Retrieved 28.07.2005. ^ Sagraves, Robert D (April 2005). "The Indirect Approach: the role of Aviation Foreign Internal Defense in Combating Terrorism in Weak and Failing States" (PDF). Air Command and Staff College. Archived from the original (PDF) on 2008-04-14. ^ Petraeus, David H.; Amos, James F. (2006). FM 3-24/MCWP 3-33.5 Counterinsurgency (PDF). pp. li–liv. ^ Petraeus, General David H. (2006). Counterinsurgency Field Manual (PDF). pp. 2–1. ^ a b c d Krawchuk, Fred T. (Winter 2006). "Strategic Communication: An Integral Component of Counterinsurgency Operations". The Quarterly Journal. 5. 3: 35–50. Retrieved April 2, 2011. ^ Joint Publication 3-24 (October 2009). Counterinsurgency Operations (PDF). ^ Kilcullen, David (Nov 30, 2006). "Counter-insurgency Redux". Survival: Global Politics and Strategy. 48 (4): 113–130. doi:10.1080/00396330601062790. ^ Nagl, John (2002). Learning to Eat Soup with a Knife: Counterinsurgency Lessons from Malaya and Vietnam. Praeger Publishers. ISBN 978-0-275-97695-8. ^ Thompson, Robert (1966). Defeating Communist Insurgency: Lessons from Malaya and Vietnam. Chatto & Windus. ISBN 978-0-7011-1133-5. ^ a b c McClintock, Michael (November 2005). "Great Power Counterinsurgency". Human Rights First. ^ Patti, Archimedes L.A. (1980). Why Vietnam? Prelude to America's Albatross. University of California Press. ISBN 978-0-520-04156-1. ^ Fall, Bernard B (2002). Hell in a Very Small Place: The Siege of Dien Bien Phu. Da Capo Press. ISBN 978-0-306-81157-9. ^ Trinquier, Roger (1961). Modern Warfare: A French View of Counterinsurgency. ISBN 978-0-275-99267-5. ^ Porte, Rémy. "Intelligence in Indochina: Discretion and Professionalism were rewarded when put into Practice" (PDF). Archived from the original (PDF) on November 25, 2006. Retrieved 2007-11-26. ^ Tomes, Robert R. (2004). "Relearning Counterinsurgency Warfare" (PDF). Parameters. United States Army War College. ^ Barnett, Thomas P.M. (2005). The Pentagon's New Map: The Pentagon's New Map: War and Peace in the Twenty-first Century. Berkley Trade. ISBN 978-0-425-20239-5. Barnett-2005. ^ Corporal Z.B. "Ivory Coast – Heart of Darkness". Archived from the original on 2011-05-10. ^ Omeni, Akali. 2017. Counter-insurgency in Nigeria: The Military and Operations against Boko Haram, 2011-17. Abingdon, Oxon: Routledge. ^ "Army's jungle school a global hit". Dawn Online. 10 April 2004. ^ IRNA - Islamic Republic News Agency. "US army officers will receive training in guerrilla warfare in Mizoram". Globalsecurity.org. ^ a b c d James, Joes, Anthony (2004). Resisting rebellion : the history and politics of counterinsurgency. Lexington, Ky.: University Press of Kentucky. ISBN 978-0813171999. OCLC 69255762. ^ G., Butson, Thomas (1984). The tsar's lieutenant : the Soviet marshal. New York: Praeger. ISBN 978-0030706837. OCLC 10533399. ^ "FM 3-24/MCWP 3-33.5 Counterinsurgency. (Approved for public release; distribution is unlimited.)". Everyspec.com. 2006-12-15. Retrieved 2013-09-04. ^ Hodge, Nathan (14 January 2009). "New Administration's Counterinsurgency Guide?". Wired. Retrieved 24 June 2013. Melton, Stephen L. (9 April 2013). "Aligning FM 3-24 Counterinsurgency with Reality". Small Wars Journal. Retrieved 20 June 2013. Paul, Christopher; Clarke, Colin P. "Evidentiary Validation of FM 3-24: Counterinsurgency Worldwide, 1978-2008". NDU Press. National Defense University. Retrieved 24 June 2013. ^ Cox, Matthew. "Army to Deploy 101st Airborne Soldiers to Oversee Iraqi Army Training". military.com. ^ a b c "Carter to Army's 101st: You will prepare Iraqis to retake Mosul". stripes.com. ^ 1,800 soldiers from the 101st's Headquarters and its 2nd Brigade Combat Team will deploy soon on regular rotations to Baghdad and Irbil to train and advise Iraqi army and Kurdish peshmerga forces who are expected in the coming months to move toward Mosul, the Islamic State group's de facto headquarters in Iraq. ^ Stabilization: Lessons From The U.S. Experience in Afghanistan (PDF). Special Inspector General for Afghanistan Reconstruction. 2018. Retrieved January 30, 2019. ^ "Investing in the Fight: Assessing the Use of the Commander's Emergency Response Program in Afghanistan" (PDF). RAND Corporation. 2016. Retrieved January 30, 2019. ^ Sexton, Renard (November 2016). "Aid as a Tool against Insurgency: Evidence from Contested and Controlled Territory in Afghanistan". American Political Science Review. 110 (4): 731–749. doi:10.1017/S0003055416000356. ISSN 0003-0554. ^ Eli, Berman (2018-05-13). Small wars, big data : the information revolution in modern conflict. Felter, Joseph H.,, Shapiro, Jacob N.,, McIntyre, Vestal. Princeton, New Jersey. ISBN 9780691177076. OCLC 1004927100. Callwell, C. E., Small Wars: Their Principles & Practice. (Lincoln, Nebraska: Bison Books, 1996), ISBN 0-8032-6366-X. Karnow, Stanley (1997). Vietnam: A history. New York: Penguin Books. ISBN 978-0-670-84218-6. Peter Polack,Guerrilla Warfare; Kings of Revolution,Casemate,ISBN 9781612006758.